Thousands expected in Bray… and maybe a date with Colin Farrell? “I CAN’T WAIT to see my granny when I go home”. 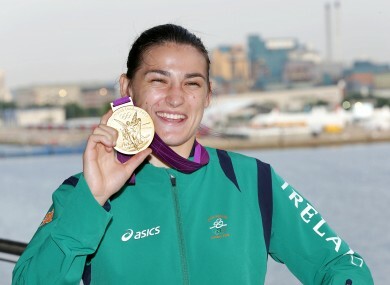 Olympic gold medalist Katie Taylor will probably have a few people to greet before she gets to meet her grandmother with her medal around her neck on Monday. A triumphant homecoming is planned with thousands expected to show up at Dublin airport to welcome Taylor and the boxing medalists and other members of Ireland’s Olympic team back to home soil. A spokesperson for the Dublin Airport Authority told TheJournal.ie that they are formulating a plan for the team’s arrival, and will release details as soon as possible. Bronze showjumping medalist Cian O’Connor has already returned home in a low-key arrival at Dublin airport. Katie Taylor will be treated to a hero’s welcome in her home town of Bray, with the town council planning to put on an open-top bus and a fireworks display. Around 10,000 people showed up to watch her final fight on big screens in the Wicklow town yesterday. Her church St. Marks has also confirmed that it will hold a thanksgiving service of some kind, but will likely wait until some of the excitement has died down. Mullinagar man John Joe Nevin, who competes for a place in the bantamweight final this afternoon will also be treated to an open-top bus when he returns on Monday. Paddy Barnes and Michael Conlan can also expect rapturous welcomes after their successes at London 2012. If Katie Taylor is up to it on Tuesday she has a hot date lined up with Colin Farrell, who has invited the boxer to join him at the Irish premiere of his latest film Total Recall on Tuesday evening in Dublin. The Sun reports that the whole Taylor family has been invited as Farrell’s personal guests. Email “Hero's homecoming: early details of Katie's return to Ireland ”. Feedback on “Hero's homecoming: early details of Katie's return to Ireland ”.